Phones, bags, vehicles, possessions, connectivity and non-stop activities. This is what every day amounts to. A hubbub. Will our salvation come not from more technology but the annihilation of it by a solar flare to take us back to a time when we enjoyed a less frenetic pace of life? Without going to extremes, we can have the best of life 30 years ago and today’s always-connected state if we just learn to let go. Sometimes. Frequently enough to ground our feet, enjoy the simplicity of life and to truly value people, places and experiences. Travel is at the core of vagabonding because it trims what you need to only the essentials; food, a warm place to sleep and only the most suitable and useful possessions in the backpack on your back. Life is simple when you’re vagabonding. When you have spent a week or two wearing only two tee shirts, one pair of pants and a pair of shorts, with your toothbrush and toothpaste as your only toiletries and cosmetics, you’ll wonder why you need the three cupboards packed full-to-bursting with clothing at home. Your mind filled with memories of your experiences and your camera’s SD card loaded with photographs are far more treasured possessions. Travel improves your ability to cope with uncertainty. Variables that you encounter may include unfavourable weather, transport delays, challenging terrain, language barriers, unusual foods and even excessive bureaucracy. The only way to deal with tough situations is to adapt. These taxing experiences trivialise occurrences back at home that would previously have left you frazzled. Having perspective is invaluable. Travel – of any kind – begins with a dream; an idea to visit a place, to see sights and to enjoy activities. Instead of waiting for the day to come when you will have enough money and time to travel around the world, dream-up close-to-home micro-adventures that are low on cost, economical on time (weekends are perfect) and that get you outside, doing activities you love. You do not need permission from anyone other than yourself. Turn dreams into reality by setting a date (or be spontaneous), planning (not too much) and gathering necessary equipment (use what you have, borrow from friends). It takes confidence to go vagabonding, especially at first. Gain confidence with experience as you discover that you do not have to know exactly how your trip will pan out, that it just will. Vagabonding is creative. From coming up with an idea, like camping overnight on an island in your local river, to embarking on the adventure and solving problems along the way. Children benefit greatly from vagabonding. In fact, the best education that you can give your child is exposure to the world through travel and activities. They gain awareness of the world around them and tolerance of people and cultures through the differences that they encounter. They learn to adapt to new environments, develop courage to try new experiences and get much-needed self-confidence to thrive in uncertain situations. Just as adults become more open-minded as a result of travel, so do children. Young vagabonders learn how to live in our varied world, to think creatively, to play unassisted by technology and to live with less. 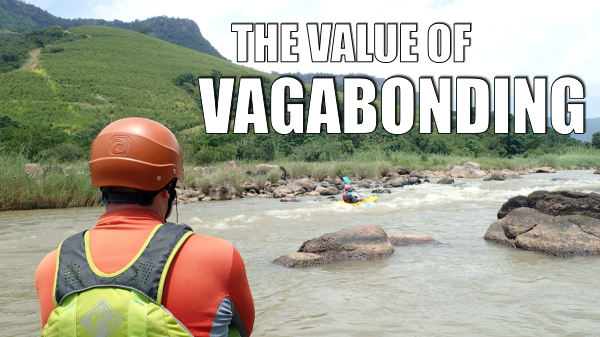 Experienced young vagabonders develop the confidence to find their own way – outdoors and in life. Being a vagabond does not mean a shaggy beard, months on the road and gruelling physical undertakings. A vagabond is the person that you are and want to be through your actions, activities, awareness and acceptance of the world around you.